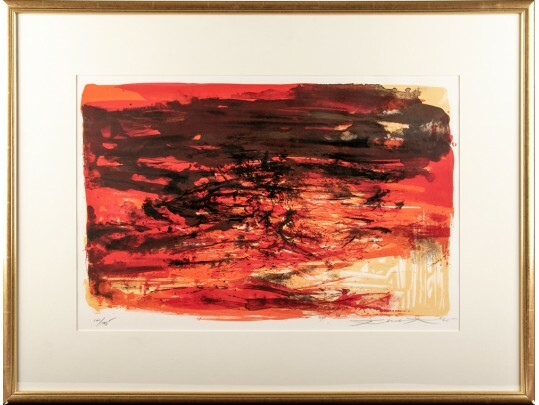 A stunning and highly sought after Zao Wou-Ki (Chinese/French, 1920-2013) original lithograph titled "LXIV," c. 1965. This edition 121 of 125 depicts an abstract in five vibrant and bold colors. The piece is pencil signed, numbered and dated along bottom margin. Matted behind glass in contemporary gilt frame this piece is sure to make a statement on any wall it garnishes. In great condition with the frame with some minor sporadic gilt loss. The piece measures ss: 16" h. x 23 1/2" w., overall 25 1/4" h. x 33 1/4" w.